Tymon Mellor: At 11.39pm on the 3rd August, 1972 Mr M. McMillan, a construction superintendent became the first member of the public to drive from Hong Kong Island to Kowloon through the new cross-harbour tunnel. The tunnel project was a first, not only for connecting Hong Kong to Kowloon, but also for using private capital to finance the project under a ‘Build Operate Transfer’ arrangement. However, the story of its beginning started 70 years earlier with a proposal for a bridge. “a proposal has already been before Government in a special form and I reproduce it in this my Annual Report”. 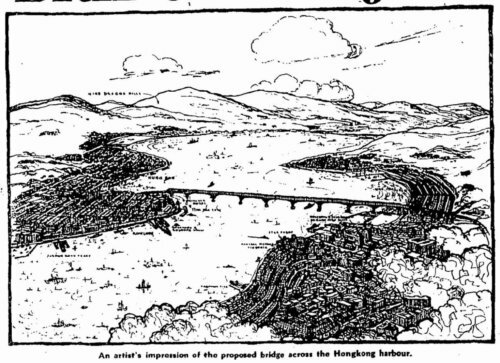 The proposed bridge would have been about 1 mile long, running from Pottinger Street to Tsim Sha Tsui, and landing at Nathan Road (or Robinson Road as it was named at the time). 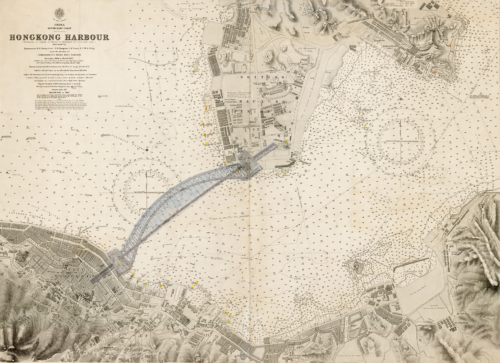 He proposed splitting the harbour into two areas, although the bridge would have a break with a swing or draw bridge arrangement to allow ships to pass on their way to the docks. To pay for the bridge, he proposed a toll arrangement. There were 6 million harbour crossings each year and that was probably going to increase by 50%, thus with a 1 cent toll on 9 million crossings, he forecasted a substantial return on the investment. With the departure of Mr R. Murray Rumsey, it seemed that there would be no champion for a fixed crossing. Public interest in the crossing, like the Government, seemed to ebb and flow. 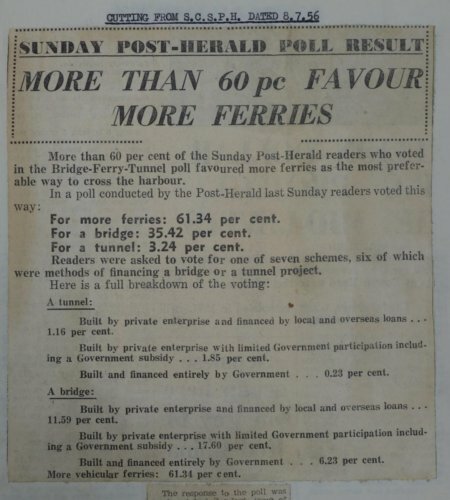 As the clipping below from The Hong Kong Telegraph in 1947 shows, there was interest and a desire to make progress with a scheme. 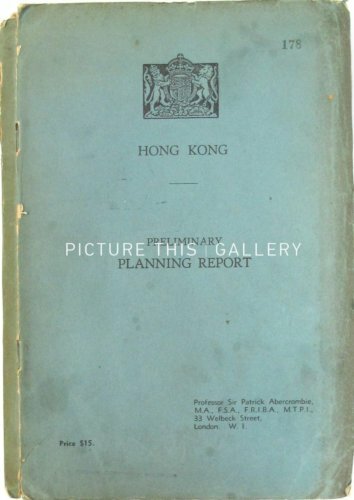 In 1948, Sir Patrick Abercombie, published the Preliminary Planning Report for Hong Kong. This was the first strategic plan for the Colony, funded by the Colonial Office it was intended to help the post-war Hong Kong administration with the development of the territory. Returning to current times, with the expected completion of the Shatin to Central Link Phase 2 in 2021, the dream of that direct railway connection will eventually be achieved, albeit 73 years later, and possibly without the fish. 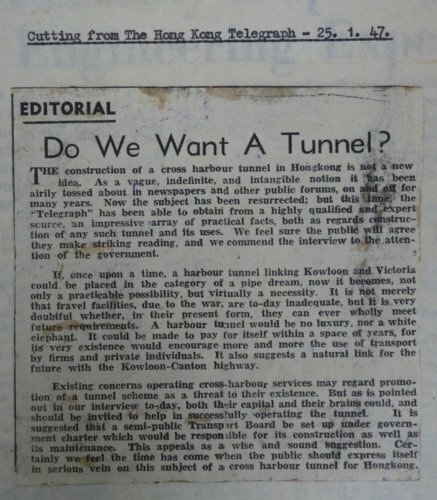 In 1950, a Government advisory committee reviewing the long term ferry service, recommended a proper review of Abercrombie’s recommendation for a cross harbour tunnel. The following year in 1951, the Government announced its intent to consider such a crossing. 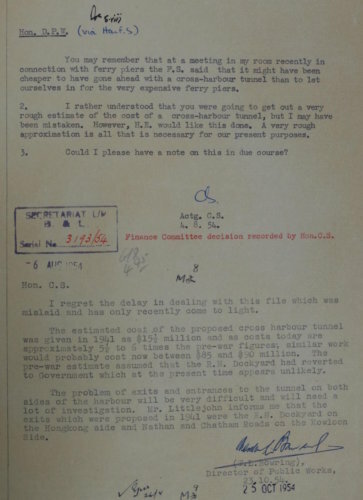 In December 1954 the Crown Agents, the UK Government body responsible for conducting transitions for the colonies, wrote to the London based consultant Mott, Hay & Anderson on undertaking a study on a cross-harbour tunnel. 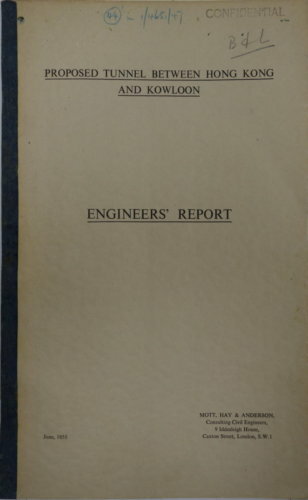 Following a visit to Hong Kong in March 1955, they produced a report in June, 1955 on the feasibility of the crossing. The report concluded that there would be no engineering difficulties in constructing the tunnel, but the choice of entrances was very limited and with a suitable roundabout arrangement, the two lane tunnel would not add to the existing traffic congestion. Two tunnel solutions were explored, a traditional driven tunnel with a cast iron lining, and a ‘cut and cover’ tunnel using precast concrete immersed tubes. The driven tunnel would use the approach adopted in UK of driving the tunnel with a shield and erecting cast iron linings behind. This approach would have required the importation of 35,000 tons of cast iron and the use of high air pressures to maintain a stable tunnel face during construction. 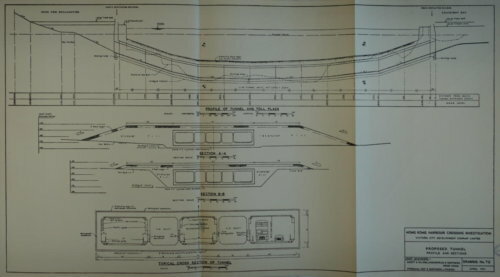 The immersed tube arrangement required the fabrication of tunnel units, 73m long in steel and concrete, to be floated into place and sunk into their final position and then joined together before backfilling with rock. The consultant recommended the immersed tube solution on the grounds of cost, greater employment of local labour, shallow depth and suitable manufacturing facilities being available. Two single lanes for traffic would be provided, leaving pedestrians and rickshaws to continue to use the ferry services. The proposed alignment started with a new roundabout at the Garden Road/Queens Road junction with the tunnel diving south into the hillside before swinging around to pass below the military facilities northwards and across the harbour. Passing below the KCRC Kowloon Terminus rather than placing an tunnel entrance in Nathan Road, it would be located east of it along Chatham Road. The cost of the scheme was estimated at HK$140 million and required 72 months to construct. An Inter-Departmental Government committee was set up to review the proposal and published its findings on the 12th June 1956. The committee found that the projected traffic flows through the tunnel would not be sufficient to repay the construction cost and ruled out any justification for a subsidy for the scheme. At around the same time the Government was exploring the crossing options, the late Dr Guthlac Wilson of Scott & Wilson proposed in 1952 to Mr K. B. Allport of Harriman Realty Co Ltd, a subsidiary of Wheelock Marden & Co Ltd, the construction of a bridge crossing the harbour. This would extend from Morrison Hill to Chatham Road using an eight span double deck bridge. The proposal was developed in sufficient detail that by January 1955, the HK$104 million project was submitted to Government for consideration. The bridge spans were 180m each, set 57m above the sea level, sufficient for the largest ships to pass underneath. 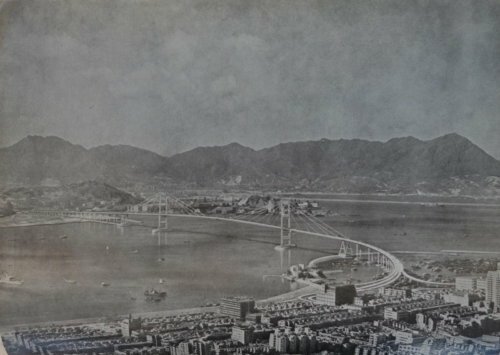 Initial feedback from the Government was non-committal but work continued on the design, and by June 1956, a new proposal was made based on a five span arrangement of 275m spans with an updated cost of HK$152 million. Despite all the benefits of a fixed crossing, the general public was not yet warming to the idea, as can be seen from this 1956 Sunday Post-Herald article. Interest seems to have been lost as the focus was on livelihood issues, giving the Government a way to down play the new schemes. With the recognition that the door was open to a private crossing solution, Harriman Realty Co Ltd started detailed discussions with Government. A key issue was the need to compensate the ferry companies. The Star Ferry company indicated that it would suspend investment in new boats until the Government confirmed the crossing was not to proceed. The expeditious publishing of the Inter-Departmental Government committee findings in 1956 was sufficient to calm the waters. 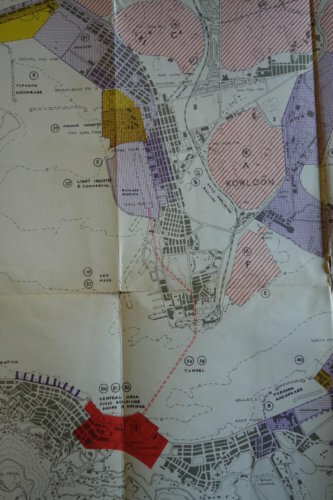 In 1957 the Government reserved land in Morrison Hill for any future bridge proposal and in March 1959 The Victoria City Development Co Ltd was formed to promote the project. The founding companies being; Wheelock Marden & Company Ltd, Hutchinson International Ltd, Kwong Wan Ltd and Sir Elly Kadoorie Successors Ltd. These were joined in 1969 by the Government and HSBC. Scott Wilson, Kirkpatrick and Partners were commissioned to prepare a more detailed study on both a bridge and a tunnel crossing, and in 1961, were joined by the UK consultant Freeman Fox & Partners, specialists in the design of long bridges. “The bridge would offer the better solution were it not for the possibility of objections by marine and aviation interests. We believe that there is room for acceptable compromise between the needs of these interests and that the merits of the bridge should be carefully weighed against such objections before a tunnel is considered”. 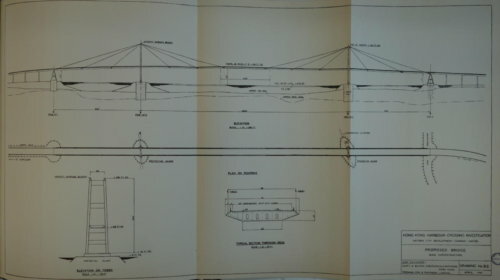 The proposed bridge was designed as a cable stay arrangement, rather than the conventional suspension arrangement, in order to avoid the need for the substantial end anchor arrangements. This was estimated to save the bridge construction £0.5 million. The bridge would be 1,125m long with a centre span of 625m and side spans of 250m. This is about 50% longer than the Kap Shui Mun Bridge, or similar to the Ting Kau Bridge. The bridge would have had five traffic lanes, two in each direction and a reversible centre lane. The alignment would commence from the proposed reclamation at Causeway Bay and land on the proposed Hung Hom reclamation, and integrate with the proposed road network. The location was selected for the space available on each side of the harbour for the new roads and toll plaza. The tunnel solution was therefore an additional £1 M in capital cost and with higher operating and maintenance costs. After much discussion in 1963, the Government stated that the bridge would be an unacceptable hazard to aircraft but it was prepared to offer the company a franchise for the construction of a four-lane tunnel between Wanchai and Hung Hom. In July, 1965 Legco approved in principle the basis for a Cross Harbour Franchise agreement with the Victoria City Development Co Ltd, including in the 30 year franchise the payment of a 12.5% royalty on gross operating receipts for the first ten years, the option of a 5% equity to the two ferry companies, and the contribution of HK$12 million for the cost of new Government roads associated with the proposal. The offer was accepted by the Victoria City Development Co Ltd and the franchise was transferred to the Cross-Harbour Tunnel Co Ltd to construct, to own, and to operate the new tunnel in 1965. 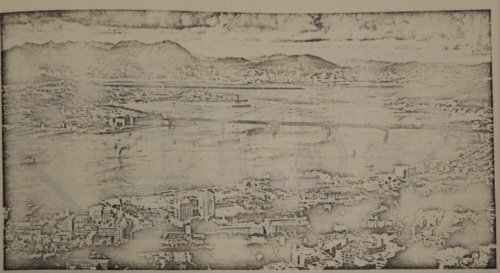 In late 1965, the study’s consultants were re-appointed to prepare the detailed design for the tunnel with an estimated cost of HK$280 million. In June, 1969 the Cross-Harbour Tunnel Bill was approved by Legco and construction of the project could commence. Part Two will address the construction of the Cross-Harbour Tunnel. This article was first posted on 21st November 2016. 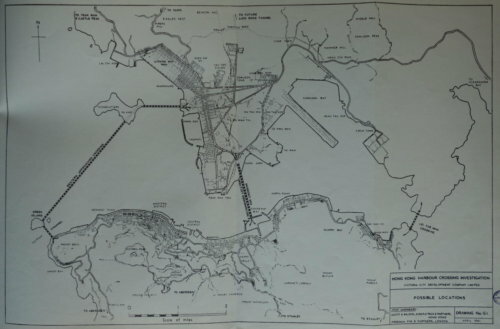 Cross harbour road tunnel – link to planning of Shing Mun reservoir, late 1920s? Thank you for this wonderful website! Very detailed and nostalgic.